This was the first detailed travelogue that I have read in recent times. William Dalrymple talks about the rich cultural heritage of the city, something which has kept the city lively for the centuries. With this book and other travelogue books on cities around the world, William Dalrymple has earned a name in the field of travel writing. It is also a reminder of the rich heritage of Delhi, but it pains to observe that we are so ignorant about the historical importance of many places of interest in Delhi. William Dalrymple actually stayed in Delhi for few years to visit all the places himself and talked to people. While most of the history books teach what government or a school of thought wants to be taught, they hardly go into the legends that are popular in the masses. This book covers that too. The book starts with the author talking about the past of his landlady, a Punjabi. The author comes to know about her plight during the partition of India. She also talks about the 1984 riots which author has described in detail. Indeed it was a scar on the face of Delhi which will get a long time to heal. Author's interviews with Balwinder, a taxi driver, reveals what common person thinks about the system. The author concludes that after five years things are getting back to the normal with Hindu's going to Gurudwaras in devotion as before. 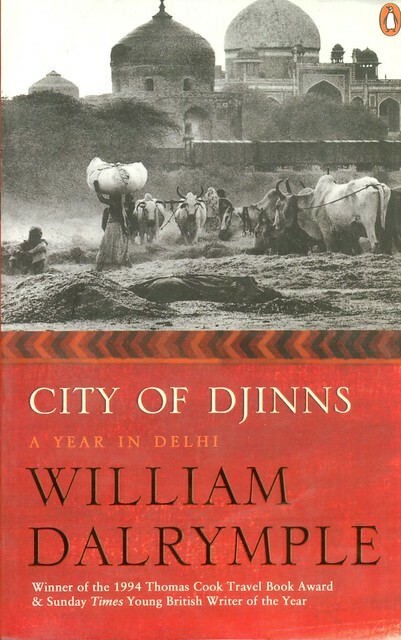 The title of the book is based on the conversation of the author with a fakir, where he gets to know that this city of Delhi is protected by the djinns. The author also gets to know about many legends of the Khwaja Nizamuddin Chishti, who is said to have cursed the Delhi Sultanate and whose name and fame far exceeded the rulers of his time. Even today the followers of the saint flock to his Dargah. The author describes the Mughal heritage of Delhi. He quotes many travelers across the world who visited Shahjahanabad, present-day Old Delhi or Chandni Chowk area, then capital of Mughal Empire under Shah Jahan and Aurangzeb. He also describes the palace gossips and the luxurious lifestyle of lords under the Mughal rule. Their successor preserved whatever they could of that heritage and the author tries to locate many places mentioned in the writings of that time. The author observes that after the fall of Aurangzeb, the empire declined gradually and gradually it was less known for its military and political might and more for promoting dancing-singing and Urdu poetry. People would go from Delhi with new couplets of a renowned Urdu poet. This tradition of Urdu poetry and calligraphy was thought to be in danger once India got independence and many people went to Pakistan. The author even went to Karachi in Pakistan to meet one such person. A major portion of the book is given to the colonial past of Delhi, probably due to availability and authenticity of the historical sources. The author describes the events from the time when Delhi residency was established. At that time India was ruled from Kolkata. Going from Kolkata to Delhi was full of risks and many such incidents of adventure can be found in the literature of that time. One such adventurous person during the initial days of British in Delhi was James Skinner of the Skinner's Horse, a regiment of Indian Army. Initially, the English and Scottish persons on the Company's payroll tried to mingle with the people of India and many of them had children with Indian wives but after the revolution of 1857 everything changed and policy of segregation was adopted with a sense of superiority among officers who came to India to serve the British Empire. The author also describes the incidents of the uprising of 1857, in which many innocent people from both sides were murdered mercilessly. The author also talks about the ancient Hindu past of the city. It is a common perception among the people that ancient city of Indraprastha was at the place where Purana Qila stands today. Excavations at the Purana Qila have led to the unearthing of Painted Grey Ware(PGW) of the Mahabharata Era. To know more about this the author met Prof. B. B. Lal of Archaeological Survey of India (ASI). He asked Prof. Lal what were his views about the historicity of the Mahabharata's epic story. Prof. Lal gave him an anecdote where a tragedy that he experienced became a folklore and forty years after that incident he listened a folk version of that incident significantly modified. The point which Prof. Lal wanted to make was that if in forty years such changes can happen in a version of an incident, one can only imagine of the modifications in the Mahabharata story after so many centuries. This book served one purpose very well that is to arouse my interest in the travelogue genre of literature. The quotation of sources and visit to many places, like Karachi, Shimla and even back to the UK to talk to people and read the old documents to get the feel of Delhi's past, have added to the authenticity of the book. William Dalrymple's wife Olivia Fraser was an artist who also accompanied author on his visit to India and she made sketches of what he saw in Delhi. These sketches have been included in the book frequently. Many incidents are written in the style of conversation and author met a lot of people from different walks of life. As Delhi is known the city of cities, the author has tried to include all the cities of Delhi in his book.